Governor Terry Branstad and Lt. Governor Kim Reynolds talk to the State Board of Education. Governor Terry Branstad told members of the State Board of Education Tuesday that he will continue pushing his education reform plan to improve the quality of teachers and the education given students in the state. The legislature approved some parts of the governor’s education plan last session, and he told the board that everyone knows the education transformation is not going to be easy to complete. “I think some people are disappointed that we didn’t see more progress in the last session, but I’m a pretty tenacious individual. I don’t give up, in fact as my old football coach used to say ‘when the going gets tough, that’s when the tough get going’. So I think that’s what we’ve got to do on this, I think it’s critical to the future of our state,” Branstad said. The governor says he will focus on improving teacher preparation, as he believes that’s where you start to turn things around. “We had an interesting meeting with all the colleges and universities that have colleges of education and there’s some fear and trepidation about this, but I think this is one of the critical areas,” Branstad said. 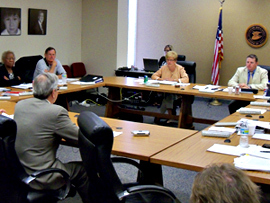 Governor Branstad speaking to the State Board of Education Tuesday. Branstad said the clinical training for teachers would be similar to what he saw as president of Des Moines University where doctors are given advice and support by those who have experience in the field. He says better teacher preparation should include a look at how the resources are used. “We need to come up with a better way to have the money follow the kids, or go to where it’s going to be more effective in terms of learning. 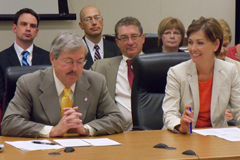 As opposed to saying, well it’s got to go according to this formula, “Branstad said. “The idea of having the money follow the kids, I think that was kind of what open enrollment was about, and I think that’s not a bad concept.” Branstad said changing the funding always raises questions. “And I can tell you on open enrollment there will be some people who will say ‘well this has been used for some families for convenience to have them go to a school where they are working or something like that.’ But I think the focus needs to be on what we can do to help students achieve at the highest level possible,” according the Branstad. Branstad said the sold out Iowa Teacher and Principal Leadership Symposium scheduled for Friday at Drake University will address these issues.